Is there a better alternative to Playoff2011? Is Playoff2011 really the best app in Simulation category? Will Playoff2011 work good on macOS 10.13.4? 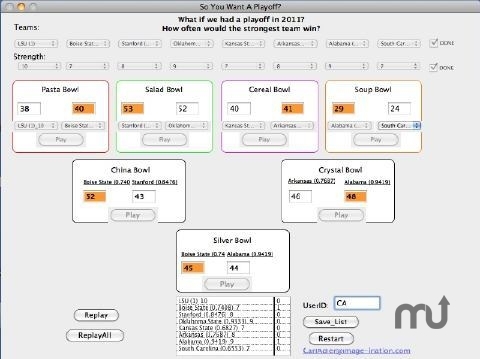 Playoff2011 is a football-themed statistical analysis tool. A search of Google with terms like "NFL Variance Randomness" will show that randomness plays a significant roll in determining results. That should not be a surprise. The same should be true in the college game. There are many factors that can not be well controlled, which can impact the game, such as, illness, injury, weather, officiating, personal relationships, academic problems, and so on. That is why we play the game. What is commonly suggested is a 8-team single elimination tournament. Playoff2011 needs a review. Be the first to review this app and get the discussion started! Playoff2011 needs a rating. Be the first to rate this app and get the discussion started! The application Playoff2011 is available to download. It is a simulation of a hypothetical single elimination 8-team playoff assumed to have occurred at the end of the 2011 season. The eight teams are chosen by the user from the 10 top teams in the final BCS standings in December 2011. The user can choose the teams and set the strength of each to any number from 1 to 10. Playoff2011 is setup so that, if a team of strength 8 plays a team of strength 2 a great number of times it will win 80% of the games. In any given 100 such games this number may very from around 75% to 85%, but usually will be close to 80%. Finally the user picks the initial pairings in the first four games.